The Gingerbread Collection, inspired by the fairy tale magic of the Christmas season, is a range of essential baby products decorated with festive images. 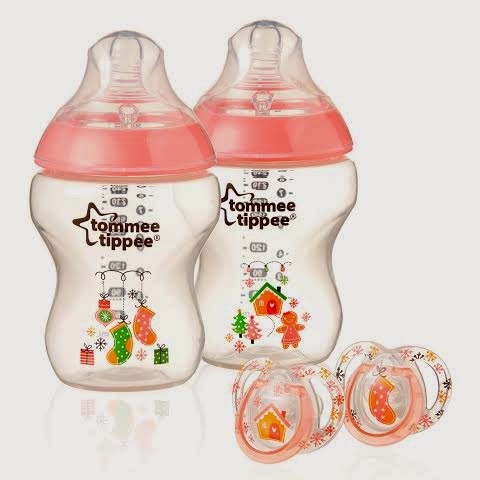 The collection from tommee tippee® closer to nature® consists of 2 gift sets containing 2 bottles and 2 soothers in pink or blue and 2 single 260ml bottles. Each bottle has a unique Gingerbread or Christmas design and comes in a gorgeous presentation / gift box. The tommee tippee® closer to nature® bottles are suitable to use from birth and are designed to mimic the natural flex, stretch and movement of mum’s breast. Together with the super-sensitive valve the bottle encourages baby’s intuitive feeding action for a comfortable and relaxed feed. With tommee tippee® closer to nature® bottles, switching between breast and bottle-feeding is easier than ever before. The specially designed compact shape allows the bottle to be held in the most natural position during feeding, allowing baby to be closer to you. All bottles are BPA free. The baby approved* soothers are designed with a new style longer flatter teat to support healthy oral development. To celebrate the launch of the Gingerbread range tommee tippee® have published an interactive fairy tale telling the story of Mr Gingerbread and his Christmas journey. The book brings to life a magical fairy tale world where the gingerbread people live…share the story with your little one here. As a extra added bonus tommee tippee® are also giving Mummy To The Max readers the chance to win a Gingerbread Collection in pink. To enter all you simply need to do is enter the rafflecopter below. Good Luck! I just wanted to say, thank you for all the lovely giveaways you've been doing, they are fab!